Once you have narrowed your choice down to two excellent mandibular advancement devices, all you need is a fresh, objective look at both of them in order to know for certain which one of them is the right choice for you. We have made this AirSnore VS ZQuiet comparison for that purpose. See how well these devices satisfy our criteria and which one of them we believe is the more reliable and effective snoring aid. AirSnore mouthpiece is a mandibular advancement device designed to prevent snoring caused by obstructions of oral airflow. 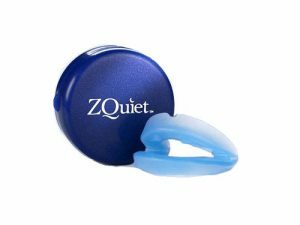 Along with the mouthpiece, you can purchase relaxing sleep drops that can help you fall asleep faster and sleep much better. AirSnore has a lifespan of 6 to 12 months with proper use and maintenance. AirSnore mandibular advancement device is made of top-quality thermoplastic that ensures a perfect fit for your jaw shape and teeth layout. The material is 100% free of any dangerous compounds and toxic chemicals. AirSnore mouthpiece will mold itself to the inside of your mouth automatically. It uses the traditional boil-and-bite method to achieve the right fit. You can repeat the molding process as many times as you want. AirSnore is a one-size-fits-all product, so it does not require any additional customization on your part. AirSnore may cause some discomfort during the first few nights of use, but you should get used to the device within a week. AirSnore mandibular advancement device is designed to slightly push your lower jaw forward as you sleep, preventing it from falling back as your muscles relax during the night. Considered a highly effective anti-snoring aid, AirSnore should reduce or eliminate your snoring in just a couple of nights. AirSnore should be cleaned after every use. Simply soak the mouthpiece in cold water mixed with toothpaste for 10-15 minutes and let it dry completely. You can also clean it with denture-cleaning solutions. AirSnore Mouthpiece comes with a 60-day money-back guarantee. AirSnore does not come with a warranty. It works just fine for me for a week but then started falling apart for some reason. It reduced my snoring considerably but I felt the material becoming rougher and almost spongy. I might be using some wrong cleaning solutions or something but yeah, lasted about a week. I've tried to mold this mouthpiece a dozen times and I just can't get it to fit properly. I don't know if I'm doing something wrong here or do device is faulty but I can feel it's not fitting properly every time I put it in my mouth. Luckily, it can be molded as many times as you want so I guess I'm bound to get it right eventually. Hasn't happened yet though. More comfortable than other MADs I tried and what is much more important, it really works for me. I did drool in the beginning, but I guess that’s normal.